This is the sixth book in Helen Smith’s cozy mystery series featuring Emily Castles. Like all of Ms Smith’s books, there are interesting and quirky characters with subtle humor spread throughout the story. The setting for this story is especially interesting when Emily finds herself living and working with a community theatre group where things seem a bit off. Then a body turns up and Emily does her thing, trying to figure out what happened. All the words like different, unique, quirky, and unpredictable that I’d normally pull out to describe one of the previous books in the series would apply to this one. 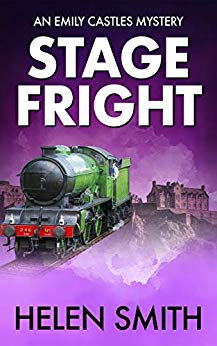 If you’ve read and liked the previous cozies featuring Emily, you’ll want to read Stage Fright too. If quirky cozies are your thing, this is a good place to start. If you think I need to find some good alternatives to use instead of the word quirky over and over again, I’m open for suggestions. The possibilities listed in the thesaurus are too pedestrian. Not quirky enough.